I was a Research Assistant at the Vienna University of Technology and I received my PhD in 2011. My research interest were back then focused on Service-oriented Architectures (SOA), Web services, and on automatic generation of testbeds for SOA. In September 2011 I left University and I'm currently working as a Software Architect at Adesso. ViSeRep - Dynamic Web Service Replication for Mobile Devices, Masters thesis project. 2) Catarci T., de Leoni M., Marrella A., Mecella M., Vetere G., Salvatore B., Dustdar S., Juszczyk L., Manzoor A., Truong H.-L. (2008). Pervasive and Peer-to-Peer Software Environments for Supporting Disaster Responses. IEEE Internet Computing, January 2008. 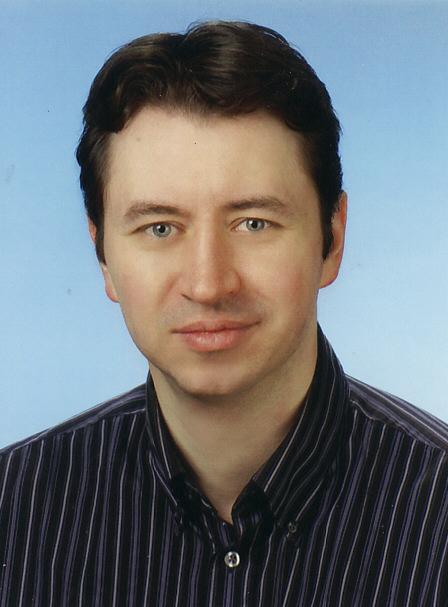 1) Dustdar S., Juszczyk L. (2007). Dynamic Replication and Synchronization of Web Services for High Availability in Mobile Ad-hoc Networks. Service Oriented Computing and Applications, Springer, Vol 1(1), 2007. 16) Juszczyk L., Dustdar S. (2011). Automating the Generation of Web Service Testbeds using AOP. 9th European Conference on Web Services (ECOWS'11), 14. - 16. September 2011, Lugano, Switzerland. 15) Juszczyk L., Dustdar S. (2010). Programmable Fault Injection Testbeds for Complex SOA. 8th International Conference on Service-Oriented Computing (ICSOC'10), 07. - 10. December 2010, San Francisco, USA. 14) Juszczyk L., Schall D., Mietzner R., Dustdar S., Leymann F. (2010). CAGE: Customizable Large-scale SOA Testbeds in the Cloud. 13) Psaier H., Skopik F., Schall D., Juszczyk L., Treiber M., Dustdar S. (2010). A Programming Model for Self-Adaptive Open Enterprise Systems. 12) Psaier H., Juszczyk L., Skopik F., Schall D., Dustdar S. (2010). Runtime Behavior Monitoring and Self-Adaptation in Service-Oriented Systems. 4th IEEE International Conference on Self-Adaptive and Self-Organizing Systems (SASO'10), 27. September - 01. October 2010, Budapest, Hungary. 11) Juszczyk L., Dustdar S. (2010). Script-based Generation of Dynamic Testbeds for SOA. 8th IEEE International Conference on Web Services (ICWS'10), 5. - 10. July 2010, Miami, USA. 10) Juszczyk L., Dustdar S. (2010). Testbeds for Emulating Dependability Issues of Mobile Web Services. 1st International Workshop on Engineering Mobile Service Oriented Systems (EMSOS). 6th IEEE World Congress on Services (SERVICES'10), 5. - 10. July 2010, Miami, USA. 9) Treiber M., Juszczyk L., Schall D., Dustdar S. (2010). Programming Evolveable Web Services. 2nd International Workshop on Principles of Engineering Service-Oriented Systems (PESOS). 32nd ACM/IEEE International Conference on Software Engineering (ICSE'10), 2. - 8. May 2010, Cape Town, South Africa. 8) Juszczyk L., Psaier H., Manzoor A., Dustdar S. (2009). Adaptive Query Routing on Distributed Context - The COSINE Framework. International Workshop on the Role of Services, Ontologies, and Context in Mobile Environments (ROSOC-M). 10th International Conference on Mobile Data Management (MDM'09), 18. - 20. May 2009, Taipeh, Taiwan. 7) Juszczyk L., Dustdar S. (2008). A Middleware for Service-oriented Communication in Mobile Disaster Response Environments. 6th International Workshop on Middleware for Pervasive and Ad-Hoc Computing (MPAC). 9th ACM/IFIP/USENIX Middleware Conference, 1. - 5. December 2008, Leuven, Belgium. 6) Truong H.-L., Juszczyk L., Bashir S., Manzoor A., Dustdar S. (2008). Vimoware - a Toolkit for Mobile Web Services and Collaborative Computing. Special session on Software Architecture for Pervasive Systems, 34th EUROMICRO Conference on Software Engineering and Advanced Applications, 3. - 5. September 2008, Parma, Italy. 5) Juszczyk L., Truong H.-L., Dustdar S. (2008). GENESIS - A Framework for Automatic Generation and Steering of Testbeds of Complex Web Services. 13th IEEE International Conference on Engineering of Complex Computer Systems (ICECCS'08), 31. March - 4. April 2008, Belfast, Northern Ireland. 4) Truong H.-L., Juszczyk L., Manzoor A., Dustdar S. (2007). ESCAPE - An Adaptive Framework for Managing and Providing Context Information in Emergency Situations. 2nd European Conference on Smart Sensing and Context (EuroSSC'07), 23. - 25. October 2007, Kendal, Lake District, England. 3) Juszczyk L., Michlmayr A., Platzer C., Rosenberg F., Urbanec A., Dustdar S. (2007). Large Scale Web Service Discovery and Composition using High Performance In-Memory Indexing. IEEE Joint Conference on E-Commerce Technology and Enterprise Computing, E-Commerce and E-Services (CEC & EEE'07), 23. - 26. July 2007, Toyko, Japan. 2) Catarci T., de Leoni M., De Rosa F., Mecella M., Poggi A., Dustdar S., Juszczyk L., Truong H.-L., Vetere G. (2007). The WORKPAD P2P Service-Oriented Infrastructure for Emergency Management. 3rd International Workshop on Collaborative Service-oriented P2P Information Systems (COPS). 16th IEEE International Workshops on Enabling Technologies: Infrastructures for Collaborative Enterprises (WETICE'07), 18. - 20. June 2007, Paris, France. 1) Juszczyk L., Lazowski J., Dustdar S. (2006). Web Service Discovery, Replication, and Synchronization in Ad-Hoc Networks. IEEE Workshop on Dependability in large-scale service-oriented systems (DILSOS). First International Conference on Availability, Reliability and Security (ARES'06), 20. - 22. April 2006, Vienna, Austria. Juszczyk L., Dustdar S. (2010). A Programmble Fault Injection Testbed Generator for SOA . Demo Session @ 8th International Conference on Service Oriented Computing (ICSOC'10), 07. - 10. December 2010, San Francisco, USA. Dustdar, S., Schall, D., Skopik, F., Juszczyk, L., Psaier, H. (2011). Socially Enhanced Services Computing, Modern Models and Algorithms for Distributed Systems. Juszczyk L. (2011). Techniques for Automated Generation of Testbed Infrastructures for SOA. Vienna University of Technology, September 2011, Vienna, Austria. Juszczyk L. (2006). Replication and Synchronization of Web Services in Ad-hoc Networks. Vienna University of Technology, May 2006, Vienna, Austria. 3rd place at the Web Service Challenge 2007 (together with Anton Michlmayr, Christian Platzer, Florian Rosenberg, Alexander Urbanec, and Schahram Dustdar), co-located with the IEEE Joint Conference on E-Commerce Technology and Enterprise Computing, E-Commerce and E-Services (CEC & EEE'07), 23. - 26. July 2007, Tokyo, Japan.